Kmart is THE place to shop these days. They’ve got all the things you’ve ever wanted, and all the things you need but didn’t know you needed. Earlier this year, I shared how I hacked their train table. Today I’d like to share our latest hack. 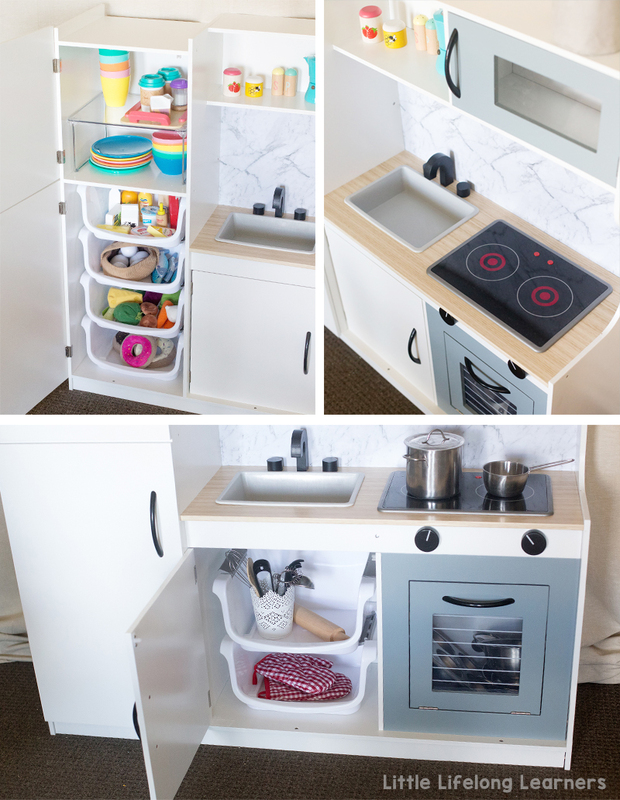 Our Kmart kitchen hack! 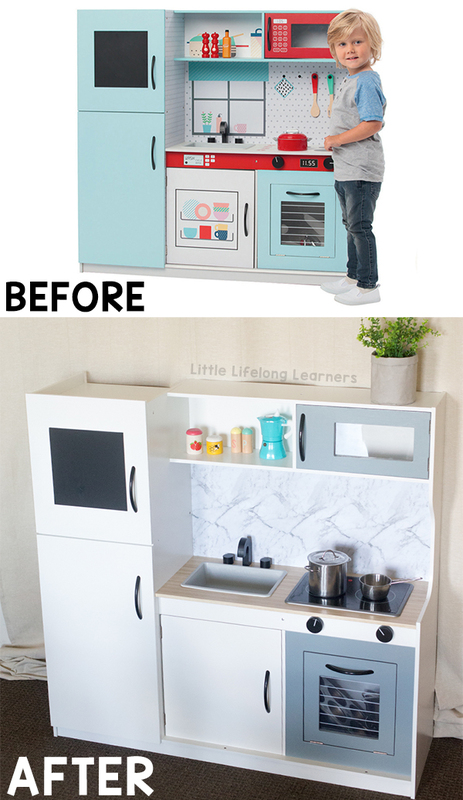 Now we already had a play kitchen at home. We actually had the Ikea one and I loved it so very much. It withstood a few years of play but my heart desired something with more storage! I really wanted a fridge to store all of our play food in. So we shopped around and found some nice ones but they didn’t really match our play space. We thought about designing and creating our own. And by we, I mean my hubby. But then all of these stunning Kmart Kitchen hacks started popping up on my facebook feed. I showed hubby and he reluctantly agreed. I spent months admiring other clever parents and their gorgeous kitchen hacks. Then it was time! 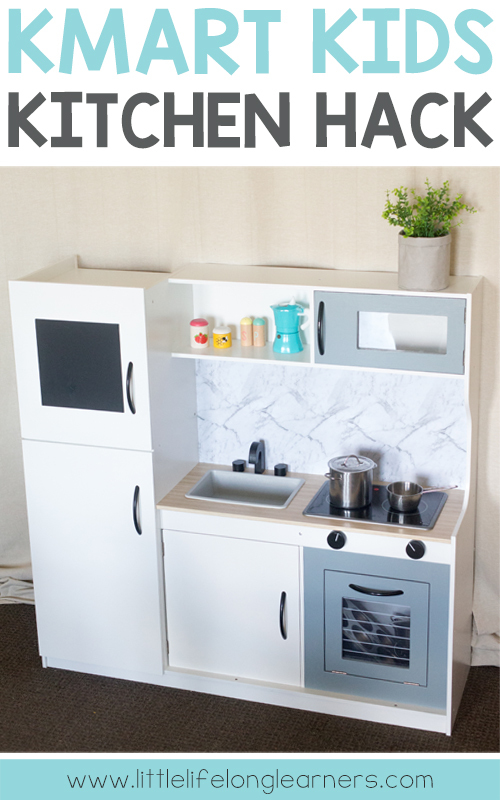 We headed to Kmart and grabbed one of their $89 play kitchens. We grabbed the last one in stock. It was a sign! Next, we headed to the craft aisle and stocked up on some vinyl adhesive. I picked the marble for the splash back and the wood grain for the bench. Once we got home, my hubby (who is also a painter by trade) started prepping the pieces. He laid them all out, gave them a good sand then added a coat of oil-based undercoat.He also cut a hole in the bench top to add our recycled Ikea Play Kitchen stove top. This meant he didn’t have to worry about painting around the stove top that was already on the Kmart kitchen. While we waited for the pieces to dry, I contacted the bench top and the splash back. After a few sad attempts (and a whole lotta bubbles) I realised that laying the pieces straight on top of the contact wasn’t the best strategy. So I got hubby to slowly slide the contact down over the pieces while I used a long ruler to smooth it down gradually. We didn’t get a single bubble this way! 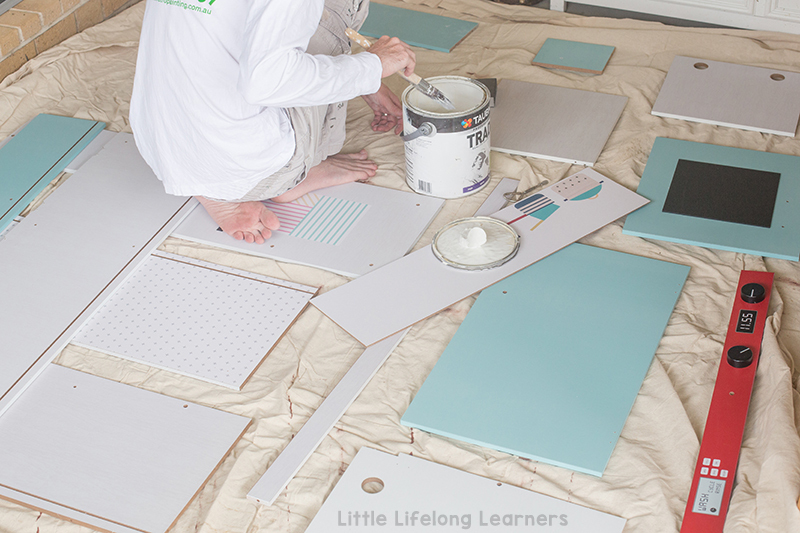 Over the next few days, my hubby added two coats of semi-gloss enamel to each of the pieces. We went with white for the bulk of the kitchen and a nice shade of grey for the microwave and oven. It took him a few days because he did two coats on each side. He also gave each coat a light sand before starting the next coat. The finish is fantastic! Then came the fun part. Putting it all together! I just love how it all came together! 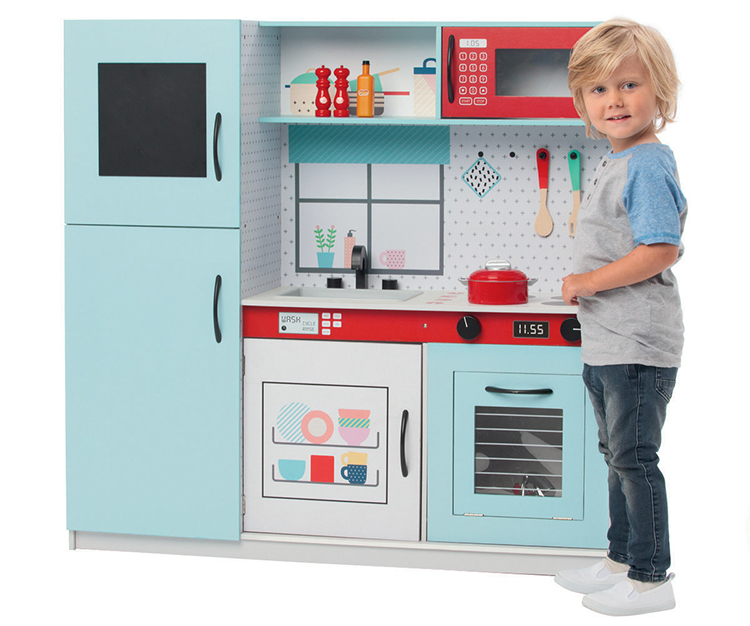 It looks like a real little kitchen…and it might even be better than our real kitchen! We set it up in our play room beside our Aldi shelves which we use to store all our bits and pieces. I rotate these items every now and then. Eventually I would like to make a matching island bench but I think we’re all hacked out for the moment! 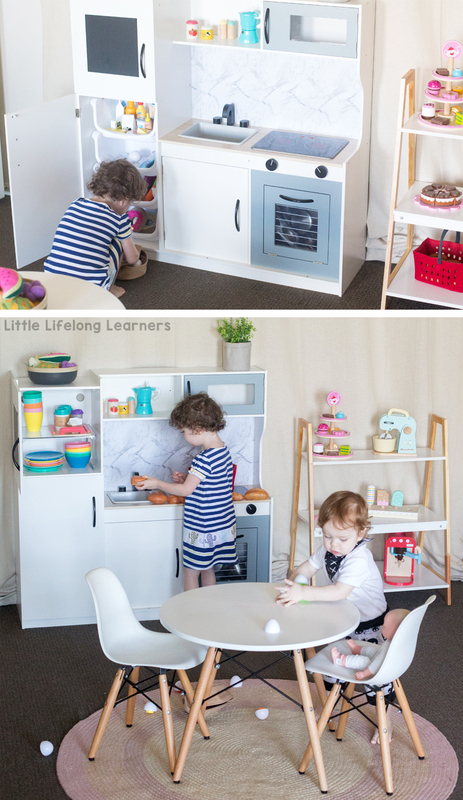 We decided to add a few storage items to our kitchen to try and minimise the mess when the kids play. First we grabbed two packets of the Set of 3 Stacking Bins for $7.00 per packet. I added four to the fridge and another two under the sink. They are perfect for organising all of our food and a few utensils under the sink. I also found a Foldable Shelf for $7.00 which I actually wanted under the sink but it was about a cm too big. So I popped that up in the freezer which is where we store all the cups, plates and bowls (which are also from Kmart). The stove top looks so realistic. My hubby suggested we recycle it from our Ikea kitchen and I’m so glad he did! We are going to hack that old kitchen into a tool bench so we wouldn’t have used it on that kitchen again. Next I want to source some racks for the oven. At the moment, all the cooking pots and pans live in there but I’d love it to be just a little more realistic. I might even add one of those adhesive lights to the top so that it lights up like a real oven! This was such an amazing project! I have been wanting to hack a kitchen for such a long time so it was amazing to see all of my ideas coming together. 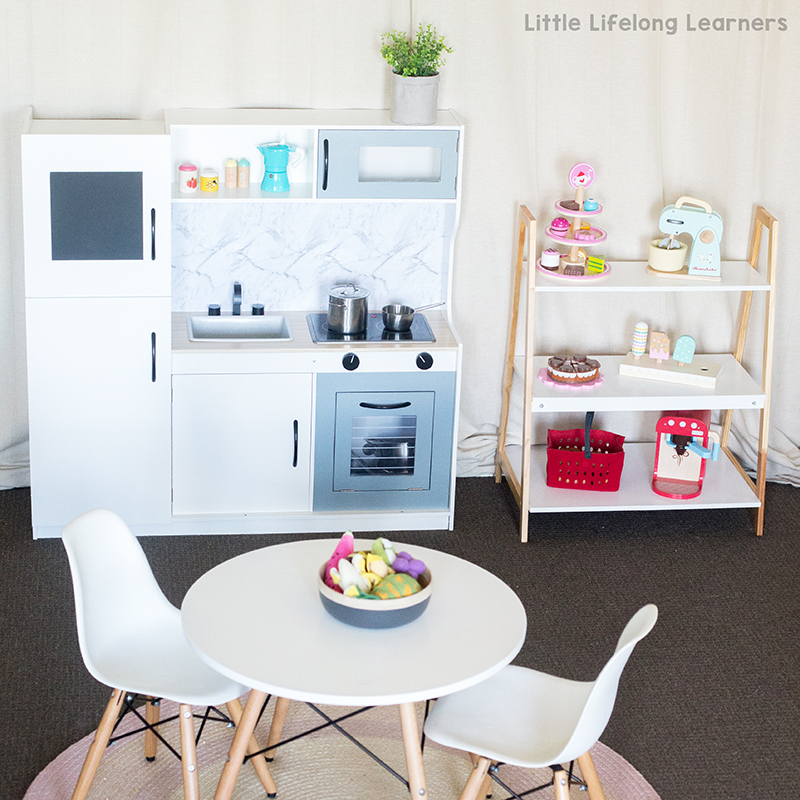 The rest of our play room is very Reggio Emilia inspired so all of these bright play kitchens just weren’t going to work in our space. I love that the kids have something truly unique! So what’s next? We will either create a matching island bench or their Ikea Kitchen tool bench hack next. Watch this space!